Our last day in Paris included a visit to the Musee des Arts Decoratifs that shows the very best of the decorative arts, an overwhelming display of skilled craftsmanship from the very old to the very new. A short stroll from Rue Moliere down the Avenue de L'Opera to the Rue de Rivoli, we were there in no time at all and filled in a happy half hour exploring the glamorous shops in the Carrousel du Louvre, an underground arcade that leads directly to the I. M. Pei glass pyramid that forms the contemporary entrance to the Musee du Louvre. The Musee des Arts Decoratifs is housed in part of the original palace that flanks the Rue de Rivoli and opens out onto the spacious Tuileries gardens. It is a treasure trove of decorative art encased in 18th century elegance. We made a delightful, leisurely stroll through time in this palace of riches, viewing relief sculpture, paintings, ceramics, wood, ivory and enamel work, glass, furniture and textiles that span centuries of civilisation from the Middle Ages and the Renaissance, the seventeenth, eighteenth and nineteenth centuries, to the innovations of style and techniques of Art Nouveau and Art Deco, and finally to the funky modern furnishings of the sixties, seventies, eighties and nineties of the twentieth. For tapestry lovers the Mediaeval rooms are particularly rewarding, resplendent with "courting couples" tapestries and the recreation of a Mediaeval bedroom with woven hangings and bedcovers. Dating from the end of the 15th C. most of the furnishings were acquired from the Chateau of Villeneuve - Lembron in the Auvergne. The interior contains a canopy bed, bench, chest and dresser placed contextually around a fireplace with carved wooden mantel. Five pieces of narrative tapestry adorn the walls, woven in Paris in 1420 and illustrating courting themes from The Romance of the Rose. Other mediaeval tapestries depict pastoral scenes including wood chopping and grape gathering. Les Vendanges (Gathering the grapes) was woven at the beginning of the 16th C. in Tournai. In a small room that displays panels of inlaid wood and small mediaeval portraits hangs a brilliantly detailed tapestry entitled Le Festin, depicting a feast, possibly in celebration of the return of the Prodigal son. Woven in silk and wool, it dates from 1510 - 1515. Two large "grotesque" tapestries occupy the walls of the salon dedicated to the late Italian Renaissance. They serve a purely decorative function as the rich narratives of the previous works give way to a more ornamental style. More treats in store include the wealth of Art Nouveau and Art Deco exhibits, including a Caldor rug woven in Aubusson, and a complete recreation of Jeanne Lanvin's Paris apartment. In 1924, The fashion designer Jeanne Lanvin commissioned the decorator, Armand Albert Rateau to redecorate her apartment at 16, rue Barbet de Jouy. His designs were drawn from the eclectic influences of antiquity, the East, and floral motifs, and incorporated the use of rare materials such as marble and bronze as well as beautiful textiles. 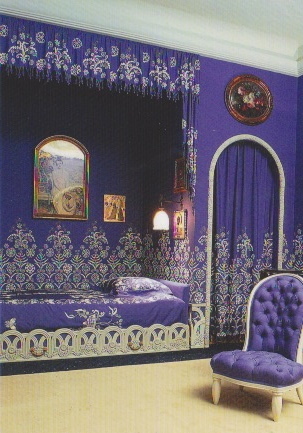 The bedroom and sitting room are draped with silk in the trademark "Lanvin blue", exquisitely machine embroidered in the designer's workshop in a delicate drop of white palms, roses and marguerites. When the apartment building was demolished in 1965 the beautiful four room suite was relocated to the Musee and presented in an authentic a style as possible. Art deco stained glass panel celebrating the manufacture of tubular steel that revolutionised furniture design between 1926 and 1931. One of my favourite rooms in the Musee sports a collection of 1960s chairs, mostly made from moulded plastic, the new material that was all the rage at that time. Accompanying the ultra modern, shaped chaises is a collage of film clips from the 60s and 70s in which each of the chairs that you are encouraged to sit in and watch, "stars" in movies from the era. It is frankly hilarious and totally fascinating, ranging from James Bond to Woody Allen. At the end the credits roll, paying homage to the designers and manufacturers of each "starring" chair! After lunch at a nearby restaurant we enjoyed the gardens surrounded by the wonderful Maillol nudes that sprout abundantly through the manicured foliage. At the Musee de la Mode et du Textile that adjoins the Musee des Arts Decoratifs there was a very comprehensive tribute exhibition to the designer Louis Vuitton that traced his rise from a designer of luggage and handbags to fashion, and his influence on the contemporary designer Marc Jacobs. It was like entering a shimmering grotto that seemed to incorporate mirrors on every surface and throbbed to a loud disco vibe. Quite disconcerting for the viewer and obviously designed as an "experience" for the younger generation. Before we left Paris we had a stunning meal at Gallopin in lieu of our inability to book at the aforementioned Le Grand Colbert. Served with great style and elegance in a chandeliered brasserie that gleamed with lights, mirrors and old fashioned charm, we were well satisfied with a menu that comprised all that traditional French cuisine could offer, a very satisfying finish to our Parisian stay.